The Mike Wheeler Band�s sophomore release for Delmark Records, Turn Up! !, gives ample evidence as to why Wheeler is regarded as one of the stalwarts of the current Chicago blues scene. In addition to performing with several blues legends (B.B. King, Buddy Guy, Koko Taylor among them), guitarist Wheeler has also served with distinction in the several Windy City bands of several current acts, including Nellie �Tiger� Travis, Big James Montgomery and the Chicago Playboys, and Jimmy Johnson. On Wheeler�s 2012 Delmark release, Self- Made Man, he showed himself to be as good a songwriter as he was a guitarist and singer, surely among the best in the business these days on all three counts. There�s no let-up at all with Turn Up! !, which includes 12 original compositions out of 13 tracks. 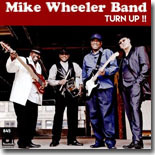 Wheeler grew up listening to multiple styles of music --- soul, R&B, rock, funk, and even disco --- and all these genres make up portions of his brand of blues. Wheeler�s band (Brian James � keys, organ, Larry Williams � bass, Cleo Cole � drums) is one of the best and certainly shine on these tunes. Their tight and steady grooves are augmented mightily by the renowned Chicago Horns (Kenny Anderson � trumpet, Hank Ford � tenor sax). The Chicago Blues is as strong as ever, thanks to outstanding performers like Mike Wheeler. For blues lovers everywhere, Turn Up!! is a stellar set of Windy City blues that will satisfy your soul. Even though he�s not yet 30 years old, Big Jon Atkinson truly has an old soul. The San Diego resident has worked with Nathan James and Kim Wilson as well as fronting his own band, the Nationals. He fell under the spell of the blues as a youngster and has developed into a versatile guitarist and a vocalist of the highest quality. Last year, Atkinson teamed with harp master Bob Corritore for a thrilling set of vintage blues at Big Tone Studio in San Diego, House Party at Big Jon�s (Delta Groove Music). It wouldn�t be a true house party without a few guests, so Atkinson and Corritore are joined by Dave Riley, Tomcat Courtney, Alabama Mike, and Willie Buck, plus guitarist Danny Michel, bassist Troy Sandow, and drummers Malachi Johnson, Brian Fahey, and Marty Dodson. Loaded with 16 tracks, about half the disc consists of original tunes from Atkinson, Corritore, Riley, Courtney, and Buck. The remainder are old-school covers. The production values give the session a vintage feel that is reminiscent of the Sun and Chess recordings from days of yore. House Party at Big Jon�s is a rousing, rollicking good-time set of traditional blues, and for the uninitiated, it serves as a great introduction to Big Jon Atkinson�s talents. He and Bob Corritore work well together, so maybe we�ll see more another collaboration from them in the future. 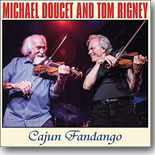 Two of the finest fiddlers in the music world, Michael Doucet and Tom Rigney, have convened for a dream session consisting of Cajun, blues, and roots music. Cajun Fandango (Parhelion Records) finds Doucet, the longtime leader of Beausoleil, joining forces with Rigney, founder of the Swamp Rock band, The Sundogs, and current leader of Flambeau, headlining a spirited session of Cajun two-steps and waltzes and deep blues numbers, backed by an excellent band (including the members of Flambeau � Danny Caron � guitar, pianist Caroline Dahl, bassist Steve Parks, and drummer Brent Rapone). Though based a couple of miles apart (Doucet in Louisiana, Rigney in California), the two fiddlers� styles fit together perfectly. The whole session has the feel of an extra loose jam session, with each bringing in several new compositions, along with several traditional Cajun classics, and a few interesting adaptations that bring the blues into the mix. Doucet�s new compositions include the rousing opener, �Marie Catin,� the magnificent multifaceted title track, and the lovely waltz, �L�Amour Perdu.� Rigney�s contributions are �Chase The Devil,� a kinetic twin-fiddle fest, the stirring �Swamp Fever,� and a reworking of his �Rigo�s Blues,� with some nice fretwork from Caron. Some interesting covers are included as well. �Maman Rosin� is an old Cuban folk tune that�s given a funky second-line rhythm. The Louis Jordan classic, �Early In The Morning,� brings the blues, New Orleans style, to the forefront, and Doucet�s own �L�Amour Poisonne� is a standout, with some nice work on Hammond Organ from John R. Burr and a supremely soulful vocal from Doucet. A pair of tunes from Cajun music legend Dennis McGee are included, �Le Bal A Chataignier� and �Oh Pauline,� a mournful duet showing the fiddlers at their very best. Finally, the pair tackle a couple of J.J. Cale tunes, the dark �Last Will and Testament� and the road favorite, �Call Me The Breeze,� that would surely bring a smile to the late Oklahoma troubadour's face. For roots music fans, Cajun Fandango is music nirvana. Whoever decided to bring these two great artists together deserves an award of some kind. Hopefully, they will do it again soon. If you�re not familiar with The Alexis P. Suter Band, I guarantee that you are in for a treat when you hear All For Loving You (American Showplace Music). Ms. Suter is described as �a true vocal phenomenon,� which is an understatement on par with �Lebron James can play basketball.� The lady sings with so much passion, soul, and fire that she will blow the doors right off your very structure if you don�t brace yourself. Though she got her start singing gospel as a child, Ms. Suter has a voice that�s built for the blues and the blues is what you get with this sensational new release. The disc kicks into high gear with the opening cut, �Talk To Myself,� a sassy blues rocker with Suter getting electrifying support from guitarist Jimmy Bennett. �Can�t Find A Reason� is a smoldering R&B ballad, one of several that feature guest John Ginty on keyboards. Suter really pours the soul on with this track, and Bennett�s economical solo is a keeper, too. �Another Place and Time� is a slow burner that Suter knocks out of the park, plus a sweet solo from Bennett on this one, too. The title track has a smooth pop feel to it that should get attention. The shuffle �Living in the World� steers toward southern rock with some strong work from the rhythm section (Peter Bennett � bass, Ray Grappone � drums), plus Ginty�s swirling keyboards. �Fool For You� is a soulful ballad that would have found a comfortable spot on a Stax recording back in the day, and �So Long� is a fierce rocking boogie with a great turn from the band as a unit. �So Long� features Suter (with able support from backing vocalist Vicki Bell) working with a heavy funk bottom and some searing fretwork from guitarist Bennett, and �Every Shut Eye� has a upbeat Latin flair. For the album closer, Suter takes the band to church on a gospel-flavored reading of the Beatles� �Let It Be,� complemented by Ginty�s keyboards. Suter ends this excellent and entertaining disc on a most inspirational note, with one of her best performances on an album loaded with high points. Alexis P. Suter has been nominated twice at the Blues Music Awards in the Vocalist categories (2013, 2015). I�m assuming the only reason she didn�t receive the award either year was because there weren�t enough voters who were familiar with her talents. All For Loving You should change that for her if there�s any justice in the world. For his new album, Albert Castiglia did things a bit differently. In an effort to better capture all aspects of his musical persona, as a singer, guitarist, and live performer, the Florida guitarist headed to Dockside Studios in Louisiana and sought the services of Mike Zito. The effort seems to have paid dividends, resulting in what is arguably Castiglia�s best solo release to date, Big Dog (Ruf Records), a ragged, raw, and rocking blues record if there ever was one. The covers include �Where Did I Go Wrong,� usually associated with Castiglia�s musical mentor Junior Wells (with harp from guest Johnny Sansone), a searing redo of Luther Allison�s �Drowning At The Bottom,� the madcap �Let The Big Dog Eat,� from Sauce Boss Bill Wharton, and Charlie Pickett�s �What I Like About Miami,� an appropriate choice for Castiglia, a longtime Miami resident. Castiglia is backed by a tight rhythm section (Scot Sutherland � bass, Rob Lee � drums, Lewis Stephens � keys). Zito produced Big Dog and adds acoustic and electric guitar, plus he sings with Castiglia on his own composition, �Don�t Let Them Fool Ya.� Zito and Castiglia have a lot in common with their rough-edged blues rock attack, so this is a match made in heaven. If there�s any justice in the world, Big Dog will make a lot of noise for Albert Castiglia. In 2015, Bing Futch became the first mountain dulcimer player to advance to the semi-finals of the International Blues Challenge. This year, he improved on that by advancing to the I.B.C. finals and winning the Best Guitarist award. Despite the recent accolades, Futch is not exactly a newcomer to the music scene, beginning his career in 1986 as part of a Christian techno-punk trio, eventually moving to composing and producing soundtracks for movies and theatre, and performing at various festivals and other venues across the country. He also teaches music, conducts Delta blues workshops across the country, and is the author of the best seller, Blues Methods for Mountain Dulcimer 101. 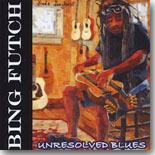 Futch has also released numerous albums over the past 30 years, but Unresolved Blues is his first �all-blues� album. He wrote, produced, and played all the instruments on the album, using his mountain dulcimer, a resonator dulcimer, and �Band-in-a-Box RealTracks� software for accompaniment. In his hands, the dulcimer alternates between delicate Piedmont-styled picking, Delta slide guitar, and even a rock edge on some tracks. In addition, he has a warm, easy vocal style that meshes pretty well on the various styles. Unresolved Blues is a nice change of pace from your regular blues album. Bing Futch bends the genre a bit with his imaginative approach to the dulcimer, not an instrument usually associated with the blues, but he remains true to the roots of the music with his playing and songwriting. L.A.-based blues belter Shari Puorto has been active in California since the late �90s, performing with or opening for many of today�s blues stalwarts. Influenced by her dad�s appreciation of blues and classic rock, she soon fell under the spell of the music of Etta James and blues rockers like the Allman Brothers. On her fourth album, My Obsession (Little Lightning Productions), she�s joined by an impressive lineup of performers, including Tony Braunagel (drums/producer), Johnny Lee Schell (guitar), Jimmy Vivino (guitar), Johnny Hawthorn (guitars), Mike Finnigan (piano, B3), Jim Pugh and Barry Goldberg (piano), Daryl Leonard and Joe Sublett (horns). The disc includes 12 tracks, 11 originals co-written by Puorto with Goldberg, Vivino, Hawthorn, and Braunagel. The tunes cover the bases on blues rockers (�Workin� The Room,� �Home of the Blues,� �Six Months Sober,� �What�s the Matter w/the World?,� �Turned To Stone�), R&B/funk (�It�s a Damn Shame,� �Better Left Unsaid,� and the title track, which is prominently featured on the front cover), and soul burners (�Sugar Daddy,� �Old Silo Road,� All About You�). The new songs touch on fairly familiar blues themes, but with a few twists that lift them above the familiar. The album�s lone cover is the Percy Sledge classic, �When a Man Loves a Woman,� certainly a tune that could be intimidating, but Ms. Puorto handles it with ease. It�s pretty cool to hear from the other side of the aisle. My Obsession offers up some top notch original songwriting and great performances. Shari Puorto has a wonderful set of pipes, ably handling the rocker and the tender ballads. Listeners could discover a new obsession of their own after checking out this excellent disc. Guitarist Mark Cameron started out in the folk-rock scene of the early �70s, recording five albums during the �80s and �90s, before turning his attention to the blues in 2009. Playing Rough (COP Records) is his fourth recording in the blues genre, and features a dozen well-crafted original tunes that showcase the Minnesota-based Cameron�s fluid guitar (acoustic and electric) and his warm, honest vocals. Cameron is backed by a superlative rhythm section (Scott Lundberg � bass, Dan Schroeder � drums), and Bill �Killer� Keyes� harmonica plays a prominent role in all of the songs as well. In addition, I really like the haunting, ethereal presence of flute from Cameron�s wife, Sheri, which adds a unique touch to these tracks. The highlights include the boogie rocking opener, �Doctor In The House,� the funky �Somewhere Down The Line,� the vintage ballad �Almost,� the amusing metaphorical �Rusty Old Model-T,� the Delta-styled �Done Me Wrong,�and the funky Gospel number �Together,� one of several tracks that feature �soul singers� Tonia Hughes and Sara Renner. The title track is a tough blues rocker, and �Hammered By The Blues� is a cool slow blues that includes some scorching harp from Keyes. For me, the standout tracks are �Blues Man�s Lullaby,� a poignant tribute to B.B. King, the stirring acapella �Close My Eyes,� and the haunting closer, �Borrowed Time,� a real after-hours slow burner that teams Mark Cameron�s heartfelt vocal and sinewy guitar work with Sheri Cameron�s ghostly flute. On several tracks there is additional musical support from Jason Craft (piano, Wurlitzer, Hammond) and Scott Sansby (washboard). 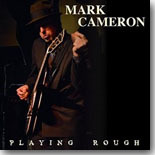 With Playing Rough, Mark Cameron and associates have given listeners one smooth set of classic acoustic and electric blues. Blind Lemon Pledge not only has one of the greatest stage names ever, he�s a masterful musician, songwriter, and performer. The artist (a.k.a. James Byfield) issued Evangeline in 2014, a completely solo effort in which he played all the instruments and explored a variety of musical styles beyond the blues --- folk, jazz, old style pop, and country. For his latest release, Pledge Drive (Ofeh Records), Pledge has crafted a dozen tunes that continue to explore the American musical palette, but with more of a blues rock edge than his previous effort. The opening track, �Run John Run,� is a tale of the post-Civil War Night Riders of the American south, backed by an irresistible Bo Diddley beat. It�s followed by the moody blues of �Moon Madness,� where Pledge enlists the harmonica of Jenny Reed to back his raspy vocals. The whimiscal �Nag Nag Nag� is next, with a tasty sax break from Rick LeCompte, then the somber acoustic lament, �Cora Lee.� "Birmingham Walk� is an interesting track, a tune reflecting on the Civil Rights Movement era driven by a funky rhythm that will remind listeners of Lowell George-era Little Feat. The sax and guitar-driven rocker �5 Weeks of Heaven� recalls a torrid love affair that ends poorly, and the bluesy �She Broke The Ten Commandments� cleverly touches on the same theme. �You Can�t Get There From Here� is a smoldering slow blues with jazz undertones. �O Katrina� is a vivid narrative that recounts the terrible 2005 storm. �You Know You Really Got The Blues� includes some of Pledge�s distinctive slide guitar. �Kokomo� is a riff on office rage and gun control taken to the rhythm track to The Doors� �Love Me Two Times,� and the closer, �Railroad Mama,� is a downhome remake of a Blind Lemon Pledge classic that will get toes to tapping and heads to bobbing. 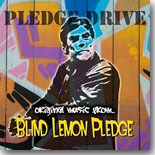 Pledge Drive is an entertaining and diverse look at blues and Americana musical styles, and you�d be hard pressed to find a better guide through this music than Blind Lemon Pledge. Midwesterner Josh Harty offers an idiosyncratic brand of Americana that blurs the lines between blues, country, and folk music. Fans of those three musical styles will enjoy his new album, Holding On, which combines the lyrical qualities and instrumentation of each of those genres. Harty�s rich and expressive vocals lean more toward the country side, but his songwriting crosses the aisle (which, let�s face it, is a pretty narrow one to start with), and he gets exceptional support from a talented group of backing musicians. The title track has a country feel, thanks to the presence of banjo and mandolin, is about the weary, relentless, monotonous life on the road and the hope for better days. �The Kind� is a moody, uptempo track with a soulful performance from Harty, and �Wired� is a strong country rocker. �Learn to Fight,� a song about perseverance through life�s trials, is one of the strongest songs on the disc. The harrowing �Ballad for a Friend� is another standout. �Running� is a moving tune about loss and regret, but �You and the Road� picks things up nicely with a jaunty countrified feel. �Shiver in the Dark� is an uptempo rocker that reminded me a bit of Dire Straits with the guitar work and Harty�s vocal. The closer, �English Rain,� revisits the travails of being homesick after a lengthy time away from home. Harty�s vocals are a big part of his attraction, but it�s as a guitarist where he sort of sneaks up on you. He mixes genres on guitar as well, with equal measures of country and blues. Josh Harty is a multi-talented artist with the capability to make an impact in several different genres, and Holding On is an album that will satisfy any music lover who decides to give it a spin. 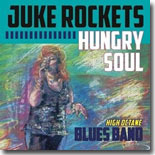 The Juke Rockets Blues Band (Carlene Thornton � lead vocals, Ron Casillo � guitars, Steve Mellor � bass/vocals, Tim Woitowitz � drummer/vocals) have competed in three of the last four I.B.C. events in Memphis, representing the Maine Blues Society. The band recently released their debut recording, Hungry Soul, an energetic ten-song set with nine originals penned by the band. Thornton proves herself to be a magnetic presence behind the mic, and is well-complemented by the versatile fretwork of Casillo and the steady-rolling rhythm section. The tunes consist of riveting blues rockers (�American Train�), funky urban blues (�Cougar,� �Can�t Complain Blues,� �Keep On Walkin�,� �Sunday Morning,� �When I�m Good�), and smoky slow burners (the title track, �Mister 7,� and �We Threw Love Away�). The album�s lone cover is a glorious reading of one of Thornton�s favorite songs, George Gershwin�s �Summertime,� a showcase for her nimble vocal talents and Casillo�s fretwork. It�s obvious that recording this song was definitely a labor of love for Thornton, and the original tunes on Hungry Soul leave that impression as well. It�s a well-crafted set of traditional blues with a modern edge that deserves to be heard. In Layman Terms consists of the brother/sister duo Cole and Logan Layman. Both are songwriters and multi-instrumentalists. Cole Layman is a skilled guitarist who lists guitarists Jimi Hendrix, Jimmy Page, Stevie Ray Vaughan, Joe Bonamassa, and Derek Trucks as influences. Logan Layman plays bass and possesses a strong and seasoned vocal style. They have competed in the IBC over the past four years, and work as a duo, a trio with their mother on drums and washboard, or as a full band with keys and horns. One more thing --- both are still in high school at Warhill High School in Virginia, with Cole graduating and Logan just finishing her sophomore year this spring. 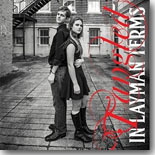 The young duo recently issued their debut release, Tangled, which features nine songs, five written by the Laymans, two from Holly Montgomery, and two familiar covers. They are backed by a solid band which includes drummer/multi-instrumentalist Ron Lowder, Jr., and keyboardist Brian Kloppenburg. Jack Campbell adds harmonica on one track, and there�s a crisp horn section (Ron Lowder, Sr. � tenor sax, Rick Thomasson � trumpet, Mike Wholley � trumpet, and Russ Robertson � trombone) on a couple of tracks. The originals are impressive. The upbeat title track features horns and a funky backdrop, with nice soulful vocals from Logan Layman. �Fake It �Til I Make It� is a slow blues with a smoky vocal from Logan and a sharp guitar break from Cole. The rocker �Don�t Even Try� is one of two songs penned by Holly Montgomery, the other being the ballad �I�m Not Ready.� �Heartbroken� is a churning, gritty blues rocker. The duo�s interpretation of �Smokestack Lightning� is is different from any I�ve heard before, more of a bluesy pop reading but it works surprisingly well. Logan doesn�t try to emulate the Wolf�s fierce style, wisely, opting for a more upbeat feel. �Won�t Let It� is a straight-up old school boogie blues tune, and �Karma� mixes funk with rock and blues to great effect, mixing in some cool slide guitar from Cole. The closer is Janis Joplin�s �Move Over,� which wraps the disc up in excellent fashion. Tangled is a remarkable debut release from a pair of blues musicians that you will be hearing much more from in the future. Ivor Simpson-Kennedy, who performs as Ivor S.K., is a young Australian bluesman. With his rugged, weathered vocal style and his smooth acoustic guitar playing, he has mesmerized audiences from Fiji to London, and he brings those talents to the recording studio for a beautiful five-song EP, Delta Pines. The five songs include the title track, an account of a journey through Mississippi that�s rich with imagery that blues fans will be able to relate to, �I Like The Way,� a clever tune that starts out as one thing and ends up with a twist, a pair of entertaining originals that lean toward traditional blues themes (�Help Poor Me� and �Missus Green�). There�s also a fine instrumental, �Pelican,� that�s included in the middle of the set. Delta Pines is an extremely enjoyable set, despite its brevity. 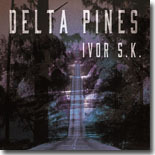 Ivor S.K. proves to be as talented a songwriter as he is a performer. Hopefully, we will get a full album from him in the near future. Roller Coaster Boogie (Dynaflow Records) grows more impressive with each listen. Not just because Jewel Brown is 78 years old and sounds like a seasoned 40-year-old and not because the Japanese band Bloodest Saxophone is fantastic. Maybe both of those reasons. I admit to not knowing who she was until this amazing disc came in the mail. Then I looked for background information online and discovered that Ms. Brown came up in Houston, sang for six or seven years with Louis Armstrong in the 1960s. She turned down a touring gig with Duke Ellington to go with Armstrong, with whom she recorded at least once and appeared in a couple of movies. In the 1950s she worked at the Dallas club owned by Jack Ruby. Ms. Brown retired from music in 1971, but the itch got her and she has been active for the past few years. The jazz background is pretty conspicuous, but she has impressive blues chops, as well. She was nominated from a Blues Music Award in 2013. The opener, "That�s a Pretty Good Love" has a Louis Jordan feel. Her vocals are gorgeous and the band is killer. Her take on "One Monkey Don�t Stop No Show" has a narrative that swings. "Good Goody" reminds of Ella Fitzgerald and the band sounds bigger than it is. Great guitar and horns interaction. There�s a definite jump blues groove to "Walk That Walk Daddy O" and "Ain�t Nobody�s Business" is a class delivered by a class act. Hearing the new album. 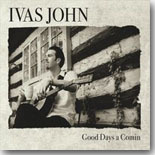 Good Days a Comin (Right Side Up Records), from Chicago-born, Missouri-based folk/blues artist Ivas John evokes pleasant memories of listening to some of the old timey string bands, most specifically Martin, Bogan & Armstrong, many years ago. This is just good quality, simple blues done well --- the type of music I could listen to live without having to insert ear plugs to keep my ears from being blasted by the sheer volume produced by many blues bands. Most of the songs here are original compositions but sound like they could have been recorded decades ago. John is usually joined by a rotating group of three or four other musicians, and their respective instruments mix together nicely. A very fine guitar player, John immediately shows off his finger-picking techniques on the opening cut, "Goin' Back to Arkansas," with fiddle accompaniment by Robert Bowlin. The mandolin picking of David Davis and dobro work of Gary Gordon highlight the next cut, "Here I Am." It was the third cut, "Roll Mississippi," that really pulled me in, as the musicians bring more of an ensemble sound to the recording. On this fun cut I hear traces of both the aforementioned Martin, Bogan & Armstrong as well as longtime New Jersey guitar wizard Lew London. Bowlin again gets to really shine on the fiddle. While raving about his exquisite fretwork I neglected to mention just how good of a singer John is, and his voice really shows well on "Roll Mississippi." I could listen to this song over and over --- in fact, I'm doing just that right now. John tackles his first cover on song number four, doing the haunting Merle Travis number "Dark As A Dungeon," with effective harmony vocals added by Roberta Gordon. Another cover is Tom Paxton's "Can't Help But Wonder Where I'm Bound," with Tim Crouch doubling on fiddle and mandolin. Some of John's best guitar picking can be heard on the James H. Jett composition done earlier by both Doc Watson and Ricky Skaggs, "Greenville Trestle High," supplemented by Davis' mandolin work. Judging from the song title, it would appear that John returns with another train-related song with the slow, shuffle number "Keep Your Train Movin'," but instead this one's more about keeping yourself going despite any problems encountered as part of normal life. The up-tempo "Payday Boogie" sounds like it could have originally been done by Bob Wills & His Texas Playboys, but instead it's an Ivas John original that is a showcase for Bowlin's fiddle playing. The theme (having fun at payday time) that's been done many times but this one fits in well with its predecessors. Closing the disc is a short, two-minute instrumental, "Sunday Morning Blues," with John soloing on guitar. It's a nice subtle end to a very good album. Recording quality is very good, perhaps just a little too pristine for my tastes, but overall it makes me want to hear more from Ivas John. If you're into quality acoustic music, be sure to add Good Days a Comin to your shopping list. 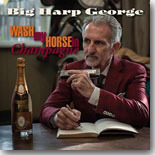 Big Harp George (aka George Bisharat) came into the blues world later in life, releasing Chromaticism in 2014 at the age of 59, after working many years as a lawyer, . He's back two years later with the very good Wash my Horse in Champagne (Blues Mountain Records), a baker's dozen of all-original compositions featuring many special guests, most notably guitarists Little Charlie Baty and Kid Andersen. It's great that Little Charlie is still keeping active on the music scene since his retirement from his longtime band The Nightcats. We get to hear Baty's fine guitar work on the opening cut, "Home Stretch," a mid-tempo shuffle that also features the piano playing of Chris Burns. It's an appropriate song considering Bisharat's transition from the legal world to the blues, as he sings about entering the home stretch of life. Bisharat shows off his skills on harmonica on the title cut, picking up the chromatic harp on this Latin-sounding tune with Baty contributing subtle guitar licks. "My Bright Future" slows the tempo down with a solid, late-night blues, highlighted by Andersen's T-Bone style guitar and subtle piano playing by Burns. Bisharat proves to be a more than competent vocalist for this type of material. Burns switches over to organ for the excellent mid-tempo shuffle "I Ain't the Judge of You," with Bisharat's singing supplemented by background vocals from Loralee Christensen and Baty coming in with a strong guitar solo. The horn section of Michael Peloquin (sax) and Mike Rinta (trombone) are added to the mix on the jump number "If Only," as Bisharat shows regret for all of the wrong decisions he made in life that caused him to lose his woman, put him in the slammer (hypothetically, of course), etc. It's a good foot-tapper that gives Andersen time to stretch out on guitar. Andersen also gets Memphis funky on the next cut, "Light from Darkness," before Bisharat comes in with tasteful chromatic harp licks. One of the jumping-est numbers here is the instrumental "Size Matters," an up-tempo shuffle on which Bisharat on chromatic and Baty on guitar trade solos back and forth. Closing the disc is the slow blues, "Justice in My Time," with the only accompaniment being subtle bass lines from Andersen. These are just a few of the standout cuts on this very good album. It's also got one of the more unique titles this year. Wash my Horse in Champagne will be a worthy addition to any blues fans catalog. 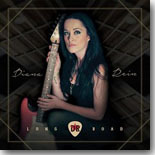 I'm not sure how to classify the music found on Diana Rein's Long Road (Rude Mood Records). She's billed as "the six string siren" and she's more than just a blues artist. In fact, her voice is very reminiscent of a young Emmy Lou Harris on some of the dozen originals here, especially on the first cut, "Long Road." If I had to classify her music, I'd call it more blues-based with a touch of rock, alt-country and other styles mingling into the mix. Rein plays all of the instruments on the CD (guitars, bass, EZDrummer), but I wouldn't have noticed it if I hadn't looked at the liner notes. It's a coherent mix that sounds like an entire band in the studio. Some of her better guitar work comes out on the urgent number "Green Light," one that could fit on both a blues and rock playlist, while "Rebel With A Cause" mixes in a bit of a soulful touch on her vocals. "The Real Thing" is another up-tempo number but this one sounding somewhat Bo Diddley-ish at times. Rein also demonstrates her ability to handle a slow number with her plea "Don't Walk Away," with the appropriate amount of tortured vocals coming out ... " ... you see that I'm damaged and unworthy of love anymore, would you hold me tight and not keep score ..." She continues the plea with the more up-tempo "Come Back Home," but this time her voice is a little more demanding rather than pleading. I really like her guitar riffs on this number --- it's bluesier than previous cuts. More strong blues guitar follows on the slower "Wicked," where Rein's voice takes on more of a rich and ethereal tone. Good mixing in the studio here. Where she previously sounded like Emmy Lou, now her voice reminds me more of Neko Case. That's also a good thing. By the end of this song I was saying "Wow!" at the strength of Rein's vocals. Closing the album is a blues instrumental, "Peace," that shows off Rein's guitar prowess. Born in Romania and raised in Chicago, Rein now spends most of her time in southern California and has merged with the band The Papermoon Gypsys. I look forward to their first recorded collaboration and to see how Rein develops as both an artist and a songwriter. She's certainly got the potential for greatness.